A black and white negative of the Whitby Lawn Bowling and Tennis Club. In this view a large number of people are bowling. The clubhouse at left was made from an old building moved from Centennial Park in 1931. This negative has started to degrade. 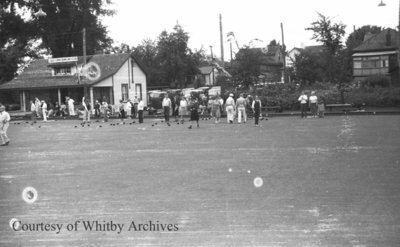 In 1927 the Whitby Lawn Bowling and Tennis Club was formed and acquired the property bounded by Brock, Burns, Green, and Pitt Streets. A clubhouse was built on the site in 1931. The property was eventually acquired by the Rotary Club in 1943 and sold to Ontario Housing Corporation in 1973 for the construction of an apartment for seniors. The clubhouse was also demolished in that year. Whitby Lawn Bowling and Tennis Club c.1937, Marjorie Ruddy. Whitby Archives A2013_040_626A.